Japanese gardens are renowned world over for their stunning beauties, and eye catchy gardening patterns. 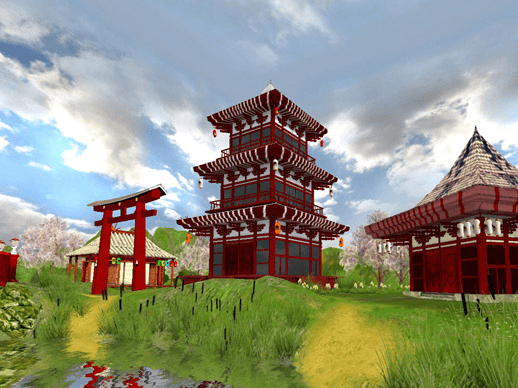 Well, if you have seen the majestic beauty of the Japanese, and want to rejoice the same over and over again, then try out the new Japanese Garden 3D Screensaver 1.0. The vibrant screensaver would offer you the real-time feel of the place, which would take you to the journey of pleasing views to cope with the tiring work stress. The application would offer the traditional tiered architecture with multiple eaves, popularly known as Pagoda. These are considered as Buddhist temples, and hence give a feeling of peace and serenity to you. Moreover, the gazebo, blooming cherry trees, the greenery and the harmonious sound complement each to complete the picturesque scenery. Install the Japanese Garden 3D Screensaver 1.0 and begin to visualize the beauty and peace of the Japanese architecture builds. It does not clutters your desktop by placing any icon, but the settings can be accessed through the ‘Desktop Properties’ options. Click on Preview option given in the Screensaver tab of Desktop Properties, to see the screensaver working. Further, if you wish to modify its attributes, then you can access the screensaver Settings from the Desktop Properties dialog. The first option provided to you is Video Mode where you can stick to ‘Use Desktop Settings` or select the Resolution from the drop down list. Next, you can select the level of volume, and enable/disable Music and SFX, as desired. Further, the settings contain ‘Graphics’ option where you can set the Gamma Control level and Fullscreen Antialiasing. With last Misc options, you’re given option through which you can enable program to Show FPS, Time and Exit on Mouse Move. Going through the Settings and making necessary selections, you can just sit back and enjoy the beauty of various scenic views. With the Japanese Garden 3D Screensaver 1.0 you get to view the beautiful scenes of Japanese architecture with greenery adding to its loveliness. The screensaver deserves 3 rating points, for the brilliant animated graphics, sound effects, the appealing view, and sophisticated performance. Let this animated 3D screensaver take you to a quiet Japanese garden, a place of peace and immense power of nature. Feel the deep spiritual atmosphere of this unique setting with the oriental pagoda in the center. Find refuge in a redwood gazebo and enjoy the view of the glorious sakura trees, the most romantic image of Japan. Gaze upon the beautiful cherry blossoms that fall like lightly sugared pink snow. Silence and serenity are in the air and only the warm wind whispers gently in the trees. This picturesque scenery together with enchanting oriental music will help you enjoy the mystical harmony with the surrounding natural world.